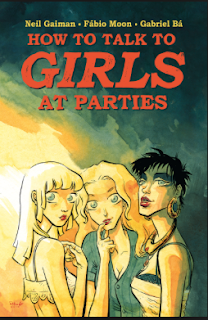 The story 'How To Talk To Girls At Parties' by Neil Gaiman was nominated in 2007 for the Hugo Award. It means that the story was recognized as one of the best examples of contemporary sci-fiction work. The story includes some elements of sci-fiction, although the elements of fantasy and comics are more noticeable. Primarily, the story expressed the feelings of young boys toward aliens for them: girls of their age. The plot is presented as a narration of memories which the main character recollected: what happened thirty years ago when he was sixteen. "... when you start out as kids you're just boys and girls, going through time at the same speed, and you're all five, or seven, or eleven, together. And then one day there's a lurch and the girls just sort of sprint off into the future ahead of you, and they know all about everything, and they have periods and breasts and makeup and God-only-knew-what-else -- for I certainly didn't. The diagrams in biology textbooks were no substitute for being, in a very real sense, young adults." As it appeared in the story two boys mistakenly came to another party where they met real aliens. It was becoming gradually clear, the girls there were really strange: one girl had six fingers on her hand, the next girl spoke in a very vague manner and so on. It is remarkable what one girl said about poetry, "We knew that it would soon be over, and so we put it all into a poem, to tell the universe who we were, and why we were here, and what we said and did and thought and dreamed and yearned for. We wrapped our dreams in words and patterned the words so that they would live forever, unforgettable. Then we sent the poem as a pattern of flux, to wait in the heart of a star, beaming out its message in pulses and bursts and fuzzes across the electromagnetic spectrum, until the time when, on worlds a thousand sun systems distant, the pattern would be decoded and read, and it would become a poem once again." The metaphorical, even philosophical meaning differentiates this story and makes it universal. There is a film with the same title based on the plot of the story. Production of this movie focused on the youth movement; punk in this case. Every reader can find in the story something remarkable. It is why the story was recognized as a winner of reader's sympathies.